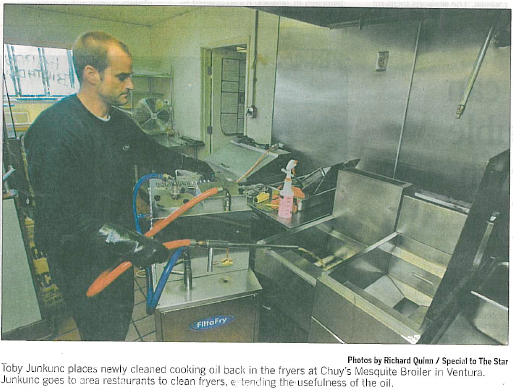 Fryer cleaning franchise helps recycle cooking oil. In a society where fast food is a staple and fries are one of the most popular side dishes, an innovative company has found a way to fatten its bottom line. 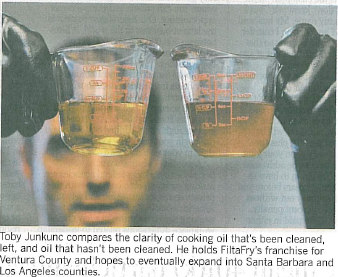 FiltaFry is a mobile operation that filters cooking oil and cleans fryers for commercial kitchens. Founded in England in 1996, the company’s Orlando, Fla.-based U.S. division launched in 2002. Since its shift into the world’s plumpest nation, FiltaFry has grown to more than 120 franchises in the United States. Toby Junkunc, a former aircraft mechanic, launched his FiltaFry franchise in July out of his Oxnard home. Drawn to the business more for environmental reasons than profit, Junkunc wanted to do something commercially with biodiesel and renewable fuel – a side benefit to the oil-filtering service. His quest is to go green in all areas of his life. In September 2005, he and his wife installed a solar electric system for their home. He also owns a solar-powered sailboat. “Being able to subsist off of just renewable energy was very enlightening, and that’s what got me going on renewable energy,” he said. FiltaFry allows Junkunc to integrate his passion for renewable energy into his day job. But getting started wasn’t cheap. His first franchise territory in Ventura County cost $24,000. He also bought options to expand into Los Angeles and Santa Barbara counties. Becoming a franchisee requires an initial investment of $63,000 to $75,000, including the cost of a van and micro-filtration unit. Junkunc filters about 2.000 pounds of oil a week for roughly 15 businesses in the county, including Andria’s Seafood Restaurant & Market, Dargan’s Irish Pub & Restaurant and Chuy’s Mesquite Broiler, all in Ventura. Using a vacuum-based cleaning system, Junkunc extracts oil out of deep fryers into a micro-filtration system, which expels food particles from the oil. Murky oil is revitalized to a clean state, so clear that when poured into a glass, you can read a business card placed under the glass. While the oil cycles through the filtration unit, Junkunc cleans the fryers, using a vacuum designed to handle 350 degrees to remove crumbs. He scrubs the darkened, greasy surface for about 20 minutes, restoring fryers to polished stainless steel. The clean oil is poured back into the fryer, good for another three days. The process doubles the life of the oil, cutting restaurants’ oil expenses in half. Potential savings is usually the selling point that Junkunc pitches when demonstrating service to interested restaurant owners and managers. He said he believes that this type of service will end up becoming more of a standard rather than an exception because restaurants, which operate on tight profit margins, will want to save money. Junkunc’s only competition is in-house oil filtration units found at most restaurants. FiltaFry’s microfiltration system is a special machine designed in England. 100 pounds of oil a week and Junkunc takes the oil away free as part of his service. Cost depends on the volume of oil, starting at $35 for the first 50 pounds of oil, then 30 cents per additional pound. Other savings are not so easily accounted for, but equally important, such as cleaner and longer-lasting fryers – as well as a labor benefit. If workers don’t have to clean the fryers, they can do other tasks. Mochizuki knows firsthand that cleaning fryers can be dangerous and messy. Reducing the risk of employees getting burned is perhaps the greatest benefit. An estimated 1.1 million people in the U.S. suffer a burn injury that requires medical treatment each year. Cooking is a leading cause of burn injuries and fires, said Victor Jackson, program coordinator of the Burn Foundation in Philadelphia. According to a government report, there were an estimated 7,100 commercial kitchen fires nationwide in 2002, resulting in an estimated 108 injuries and $116 million in property loss. Thirty-three percent of restaurant fires were caused by cooking materials, with grease and cooking oil igniting a majority of those fires. The most common type of equipment involved in cooking fires were deep fryers, according to the report by the Federal Emergency Management Agency. “Anytime you’re dealing with hot oil, there is a potential for fire,” said Lorraine Carli, spokeswoman for the National Fire Protection Association. She added that keeping a fryer clean is an important safety measure. As a preventative measure and part of FiltaFry’s services, Junkunc dips his temperature gauge into the oil to test the accuracy of the fryer’s thermostat. “At least 50 percent of the fryers I’ve accounted have some sort of differential between the thermostat and what the oil is actually cooking at,” he said. If the fryer’s cooking at too low of a temperature, from 340 to 350 degrees, there’s a problem with oil saturation, Junkunc said. More oil could be absorbed in the food because it has time to penetrate rather than just crisping the outside. With too high of a temperature, oil will degrade faster. Once fryer oil serves its purpose not once, but twice, where does it go? Waste not, is Junkunc’s motto. He works with biodiesel manufacturers to process the oil into renewable fuel for diesel vehicles, known as biodiesel. “No Middle East necessary, only local restaurants,” he said while pumping biodiesel from a 50-gallon barrel in the back of his van into the vehicle’s fuel tank. Biodiesel already is used in the transportation and trucking industries. Junkunc sees great potential for expanded use. He points out that biodiesel is a cleaner alternative to petroleum. Biodiesel offers an economical solution to high gas prices. It’s certainly saving money for Junkunc, who sees the benefits in his profit margin. His goal is to have a second van on-the road by 2007. His three year plan calls for five vans serving Ventura, Los Angeles and Santa Barbara counties.